If you catch a contagious disease, you are contagious to others and the disease spreads. Vaccines are not perfect – most childhood vaccines produce immunity about 90 – 100% of the time**. If everyone gets vaccinated, then the disease is less able to spread even though the vaccine is not always 100% effective – this is sometimes called “Herd Immunity” or community immunity. Those for whom the vaccine is ineffective, infants, pregnant women, or immunocompromised individuals who cannot get some vaccines get some protection from community immunity. If you catch a contagious disease, you increase the likelihood that more vulnerable people who may be around you will sicken and die. Healthy people who are not vaccinated risk the health of the more vulnerable. When you do not vaccine your child, you are risking other people’s lives – not just that of your child. Vaccines do not cause autism. There is NOT ONE credible, valid study that supports the claim that autism is caused by vaccines. However, over 100 peer-reviewed studies published in scientific or medical journals show that there is NO link between autism and vaccines. Even if there was a risk of autism associated with vaccines (and you and I know there is not) – autism is not worse than death, and risking the lives of your children and of strangers is far worse than having a child with some neurological differences. Most of the vaccine injuries commonly discussed by vaccine critics have absolutely no connection to immunizations other than coincidental timing with the administration of the vaccine. Less than 3% of injuries that are reported as vaccine-related injuries are true causally related events (See link to study: http://www.ncbi.nlm.nih.gov/pubmed/23063829). Most of the injuries that were actually cause by a vaccine were minor, like soreness at the injection site. I think about the unnamed babies I saw when I was building latrines in Honduras. I think about all of the unnamed babies I have never met. Without health care and vaccines, so many children die young that mothers do not always bother to name babies. In America, most babies survive and people are so ungrateful for their good luck at being born in a developed nation that they are throwing away advances in public health with both hands. To me, the blithe disregard for the staggering infant and child mortality rates in areas where vaccinations are not widely available reflects callousness toward the lives of those who are simply “not here”. 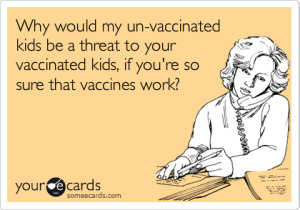 Those who do not vaccinate are taking advantage of their good fortune that the majority of people around them are vaccinated; the only reason they can ‘choose’ not to get vaccinated is because those around them are. At the same time, they do not respect the lives of OTHER people enough to see value in participating in policies that are for the benefit of everyone. So, yes – seeing a callous disregard for the lives of others makes me mad. I am also furious at the willful ignoring of scientific standards, the confusing of correlation with causation, and the lack of critical thinking by populations so privileged that they can take it for granted that their children will live to adulthood. An internet meme is not going to change my mind. Or facts. Thank you,thank you for addressing the vaccine issue in an intelligent manner based on science. I am so tired of the ignorance out there.